Happy St. Patrick’s Day everyone! It was just two days ago that my father told me that we were Irish! He took a DNA test through Ancestry.com a few months back and discovered this. Which I think is great. I’ve always loved the Irish culture and am now proud to celebrate St. Patrick’s Day as a true part Irish woman! 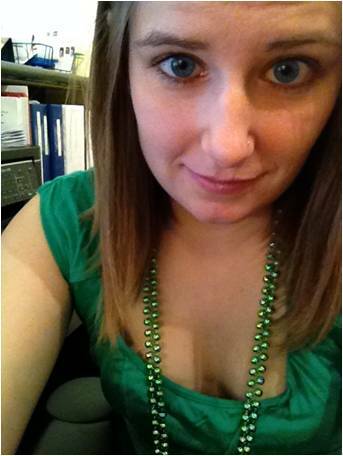 Tonight, we will dine on corned beef and cabbage and I’m decked out in my green today. In the spirit of today, I would like to share with all of you one of my favorite St. Patrick’s Day stories from when I was a kid. I was about 7 years old, at the prime of believing anything my parents would tell me. I was terrified of Santa Clause and the Easter Bunny, the Tooth Fairy and Leprechauns – really any of those made up childhood stories that were meant to entertain and thrill young children, scared the absolute crap out of me. Don’t ask me why – I was a weird kid. I remember having a conversation with my mom the night before St. Patrick’s Day. I can’t remember the details but I think I was terrified Leprechauns would come into my room while I slept. She assured me I would be fine and I slept soundly that night. The next morning I woke up and was getting ready for school when I noticed the strangest thing. A tiny footprint on my closet door. To this day, I have no idea where that footprint came from. Maybe my mom will come clean 21 years later. Or maybe – just maybe, they exist. That is such a cute story but also a little freaky! I wonder where it came from!